Sound is one of the most important modalities of communication between individuals and species, particularly for the transmission of emotive content (affect). The variety and complexity of affective aural communications in biology has long challenged scientists interested in understanding how emotive information is encoded and processed in the brain. Relatively recent improvements in electro-neurophysiological recording techniques have enabled measurements of the electrical activities associated with the processing of sounds in the brain with great precision, leading to new progress in this area. The techniques have been especially productive in studying the processing of sound by bats. Studies of the bat cerebral cortex and amygdala using these techniques have provided considerable insight into how emotional motivational information is represented in single brain cells, and how the information influences the neural circuits that guide behavior. This research, combined with other recent findings, shows that mammalian neurophysiology and brain function – including that of the human brain – is built upon a repackaging and reconfiguration of neuronal architecture and neural circuitry that evolved long ago. While we are far from fully understanding how this circuitry processes affective information, it is clear that it is this neural architecture that makes it possible for us to understand the complex auditory signals that – while we take them for granted – are central to our well being not only in primitive natural setting but also in the complex, technological societies most humans now inhabit. 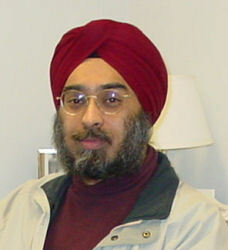 JAGMEET S. KANWAL is an associate professor in the Department of Physiology and Biophysics and the Department of Psychology at Georgetown University, and an external professor at the Krasnow Institute at George Mason University. He uses interdisciplinary approaches to understand the functional organization of the brain from the viewpoint of behavior, and he has long been interested in understanding the neural representation of social calls in the cerebral hemispheres and the amygdala of bat brains. He also has made fundamental contributions to our understanding of chemosensory systems, including the discovery of taste centers in the forebrain of fish. He was among the first scientists to use magnetic resonance imaging to study brain structure and function in awake animals, and he is internationally recognized for his work on the cortical mechanisms for the perception of complex sounds, including the discovery in bats of right-left cerebral asymmetry for processing species-specific vocalizations. He received his BS. from Delhi University and his M.S. and Ph.D. degrees from Louisiana State University. He did postdoctoral work at the University of Colorado and Washington University before joining the faculty at Georgetown University, as a founding member of the Georgetown Institute for Cognitive and Computational Sciences. His research has been funded by the National Science Foundation, the National Institutes of Health, and the Department of Defense (DOD). He has served on review panels for all of these agencies. He has organized several symposia at the national and international levels and is the author of numerous peer-reviewed publications. He is co-editor of “Behavior and Neurodynamics for Auditory Communication” published by Cambridge University Press External Link, and co-author of the popular book “Bats Sing, Mice Giggle” published by ICON Publishers, London, UK (available here External Link). He received the Alexander von Humboldt fellows award in 1995. Mr. Kanwal opened by saying he was pleased to have the opportunity to share with us and have us join his thinking about his research. He noted that our tax dollars support his research, and he also appreciates that. He said that sound is a complex phenomenon. It is the medium of a great deal of communication around the world and across species. Bats sing, and mice giggle, he noted. Affective output can be reported and quantified. To do so, we must recognize the building blocks of auditory affect: communication - the acoustic expression of affect, feature extraction - procession and succession of elements, and recreation - computing emotional valence of message elements. An important function of all these is screening; our brains reject over 90% of the incoming information, to avoid sensory overload. Chronic sensory overload can lead to stress related disorders. He recounted major features of arousal theory beginning with William James’s feedback theory. James, notably, in 1884, recast the prevailing theory which stated that a stimulus produced a feeling that produced a response. He posited that a stimulus produced a response that produced a feeling. Instead of a bear causing a fear that caused a person to run, a bear caused a person to run and running caused the fear. Mr. Kanwal showed a series of diagrams that roughly traced the development of knowledge of brain activity related to affect. William James pictured an emotional stimulus registering in the sensory cortex, the sensory cortex affecting the motor cortex, the motor cortex effecting a bodily response, and all of them affecting feeling. The Cannon-Bard theory introduced the thalamus and hypothalamus into the matter. Cannon argued that James had it wrong, that the emotion usually precedes and causes the bodily response. The Papez circuit, in 1937, brought the limbic system into the picture, including the amygdala, hippocampus, septum, fornix, olfactory bulb, mammilary body, and cingulate cortex. Papez believed the expression of emotion was due to actions of limbic structures on the hypotalamus, and the experience of emotion through projections to cortical sites. He spoke of the physics of sound, which is the alternating compression and rarification of air. This varies in frequency and amplitude, which permits music, music being a combination of tones and rythmn, melody and silence. Even the simplest elements of sound have impact; he demonstrated this with simple tones. He discussed neuroethology, the study of neural phenomena related to natural behavior. It’s purpose is to understand how the central nervous system relates biological stimuli to natural behavior. Bats, for example, use echolocation. Their auditory system is an example of how acoustic properties of sound scan be converted into a sensory map of relevant features of sounds. There are no sounds in the brain, only electrical signals. It is the variation in electrical signals that results from modulation of tones that we perceive. It is simply the modulation of sounds that determines the information in them. Spectrograms, graphs of sound, show how frequencies change over time. He showed spectrograms of people saying, “How are you?” in three different languages. Naturally, the patterns were very different. People, as they grow up, map these acoustic patterns to what they mean. The central theme of his research is communication in bats. When he began, there had been many studies of their echolocation ability. They fly with mouths open in complete darkness, catching insects. When not flying, they hang in caves, close together, in groups of hundreds and thousands. They care who they hang with. They hang near the same cave mates. When they return to the cave, they go to the same location, where they find their friends and lovers. There they make sounds, presumably for the benefit of self by the influence on others. They find mates and make babies there, and they do it in the dark. Most of the sounds they make can’t be heard; they are too high pitched. There are, however, many different sounds and there are recognizable patterns, including noise bursts. The animals also often touch each other’s faces while they make sounds. They also fight while in the pods, and the sounds made while fighting seem different. A bat brain has a large bump where the auditory cortex is, presumably related to the relative importance of sound to these animals. Mr. Kanwal puts probes into contact or near certain neurons to examine how they respond to certain sounds. He believes he has established relationships between the activity of individual neurons and frequency modulation. He has found, for example, that one neuron may have an increased probability of firing following an increase in frequency, while another one may have an increased probability of firing in response to a decrease in frequency. The probabilities were also related to the rate of change of frequency. Neurons are selective. They respond to some kinds or sounds better than others. Further, some sounds stimulate a response in a neuron, others suppress it. He was also able to condition responses to frequency modulation. After three days of exposure to pairing of certain sounds with electric shocks, neurons were responding to sounds where they previously had not. He closed by discussing possible relevance of his research with mustached bats to post-traumatic stress disorder in humans. The very distinctive sounds of improvised explosive devices and the emotional results of them make this plausible. In the question period, one person commented that it would be interesting to do frequency magnetic resonance imaging in humans and see how human brain activity changes. Another asked if Mr. Kanwal had done research in a natural environment. He had not. The equipment is too big. His bats fly around in his lab. Another asked if neurons within cortex, which is up the process stream from the amygdala, show complex patterns such as he described. No, not that he has identified. Someone asked if he was worried about driving bats batty. It did not seem so. In response to another question, he explained that, in people with post-traumatic stress disorder, people generate within the brain the actual patterns of neural activity associated with the sounds. In some parts of the brain, “hearing” is the same as “imagining” sound. Do all bats localize sound same way? Yes. In fact, the means is identical in all animals. Bats are just very good at it. The time resolution in the bat brain is astonishing. It reacts in nanoseconds. He pointed out also that deafness may result from ear problems or brain problems. You need both to function to hear. After the talk, Ms. Taylor presented a plaque commemorating the occasion. At 9:50 pm, she convened the annual business meeting, which was followed by a social hour.